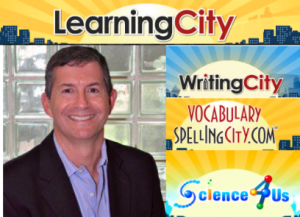 Like many parents, I think a lot about my kids and what I can give them. What will be my legacy to them? Unlike many parents, I have, while still living and in good health, passed some of my jokers onto the next generation. Tax free! One of my daughters is extremely skeptical about my collecting of jokers. Frankly, she seems to want no part of it. More than skeptical, she's practically antagonistic towards it. I'm pretty sure that she's just going through a phase. 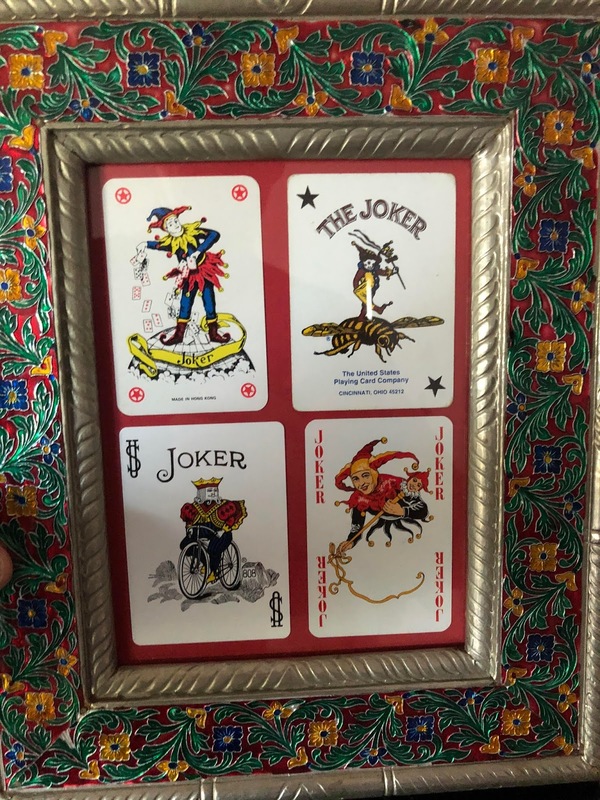 So she got just four jokers. 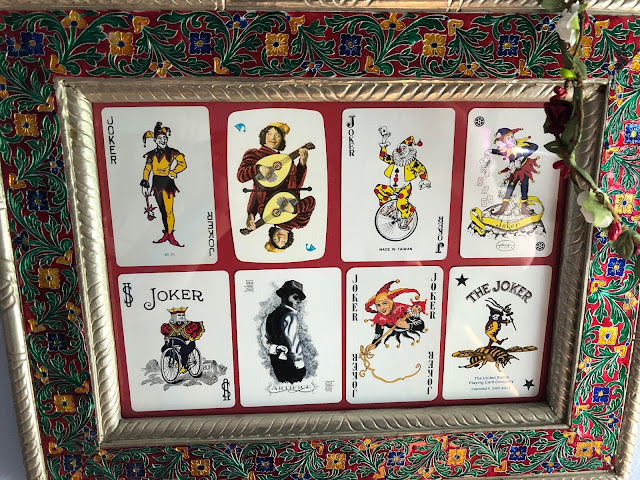 Very nice classic jokers in a sort of Middle Eastern enameled frame. The Bee Joker, a Bicycle joker, the Piaget half jester jokers, and the French classic. My other daughter is sort of interested in the collection. She has at times sat with me and watched me sort and organize them. Once she helped. She got 8 jokers also in an exotic enameled frame. 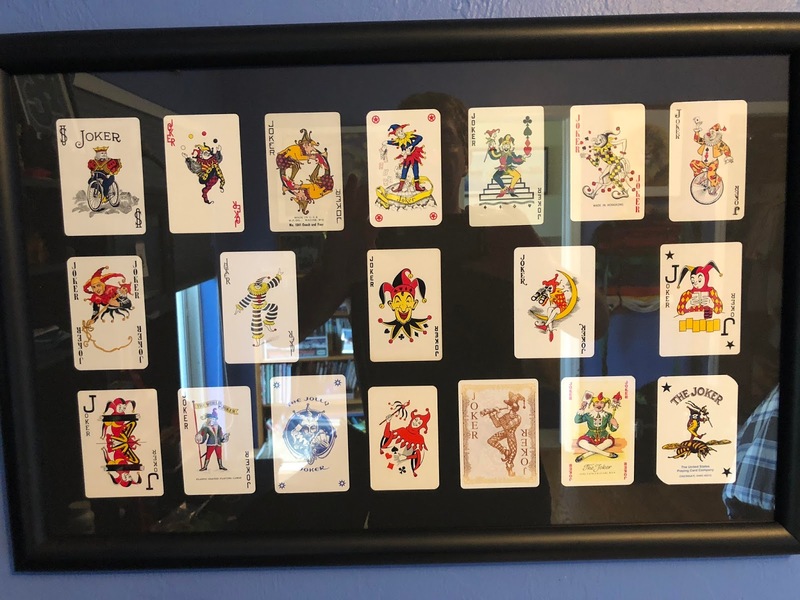 To my son who is generally enthusiastic about my joker collection to the point of helping me organize them, I have given a frame with 19 different jokers. In retrospect, I wish I had used non-reflective glass. However, I'm quite pleased with my selections of jokers. I love almost all of them. (If I did have it to do again, I would not have used the one in the bottom left corner or the far righ tin the middle. I don't think they are classy or classic enough for this group). All the others are classic choices reflecting well on my taste and the history of jokers. Don't you agree? Can you name the manufacturers of each of these jokers? "My Oldest Joker is from 1896"... I thought!